The TEC MA-1650 Is An Advanced Product That Offers An Expandable Building Block Concept! Superior Two-Line Alphanumeric and Numeric Operator Displays. Large 88-Key (Max) Programmable Keyboard. Four (4) Taxes (Including GST). 1500 PLUs (Standard), Expandable to 65,000 PLUs With Memory Expansion Option. 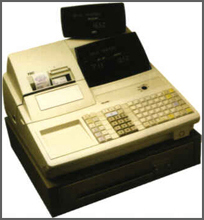 15 Full Floating or Semi-Floating Cashiers (Standard), Expandable to 99 With Memory Expansion Option. 99 Salespersons Maximum Per Terminal. High Quality 24 Column Dot-Matrix Printer (4 LPS Print Speed). Up To Six Lines of Store Commercial Message On Receipt. Validation Feature For Cheque and Ticket Endorsement. Up To Four (4) Cash Drawers (Optional). 10 Function/Media Keys, 12 Credit Card Totals, Preset Cash Tenders. Currency Conversion (5 Different Currencies Maximum). Optional Scale Interface with Scalable PLUs, Tare, and Proportional Tare. Inter-Register Communications (IRC) Allows Easy Networking of Registers Allowing Easy Programming and Report Taking. Optional PC Communication Allows Interface to Retail Management Software TECConnect and Simple Retailer.